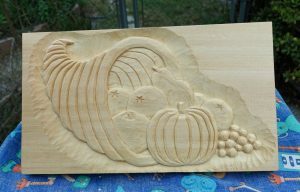 My on-line carving instructor, Mary May, created a cornucopia project prior to Thanksgiving, 2017. I did not finish my rendition in time for the annual feast, but enjoyed the process. Early stages as I define the outer edges. First with V-chisel and then variety of gouges. 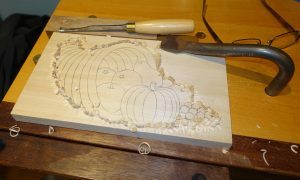 Basswood was used for its workability. 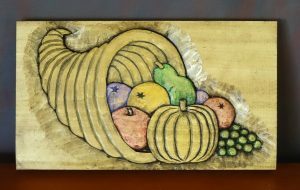 After the relief carving was completed I gave it a light spray of shellac and then “colorized” using diluted acrylic paints for a wash effect. The result was interesting. Not sure if I prefer the natural look or the painted version. From a distance the painted version can almost look like a mere painting, whereas left natural it is more obviously carved. This was a fun and relatively easy project. For my tastes I like the color much more. Impressive work Tom.